Brothers Barry and Tommy Moser were born of the same parents in Chattanooga, Tennessee, slept in the same bedroom, went to the same school, and were both poisoned by their family's deep racism and anti-Semitism. But as they grew older, their perspectives and their paths grew further and further apart. Barry left Chattanooga for New England and a life in the arts; Tommy stayed put and became a mortgage banker. From attitudes about race, to food, politics, and money, the brothers began to think so differently that they could no longer find common ground. For nearly forty years, there was more strife between them than affection. After one particularly fractious conversation when Barry was in his late fifties and Tommy was in his early sixties, their fragile relationship fell apart. With the raw emotions that so often surface when we talk of our siblings, Barry recalls how they were finally able to traverse that great divide and reconcile their troubled brotherhood before it was too late. 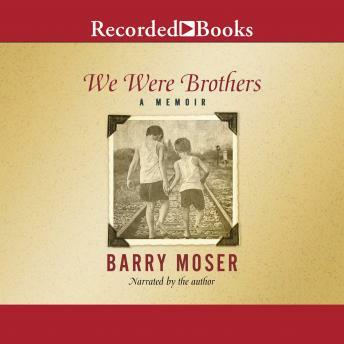 We Were Brothers, written and illustrated by preeminent artist Barry Moser, is a powerful story of reunion told with candor and regret that captures the essence of sibling relationships, with all their complexities, contradictions, and mixed blessings.